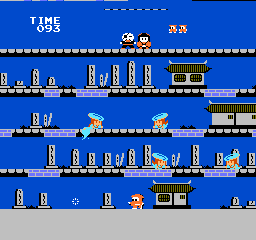 Vs. Ninja Jajamaru-Kun © 1985 Jaleco. A fun platform action game. 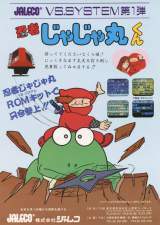 You control the little red ninja, named Jajamaru-Kun on his quest to rescue the Princess Sakura kidnapped by the Machiavellian Damazu-Dayuu. You must stop and fight against enemies to save the princess. The princess is called 'Sakura'. Nintendo DS (2007, Ninja Jajamaru-Kun - Pen wa Ken Yorimo Kyoushidegozaru) A 3d remake, this game was canceled.